Charles Rennie Mackintosh (1868-1928), made by Guthrie and Wells. 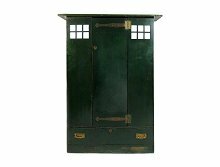 A Glasgow School Arts and Crafts stained green cypress wood wardrobe, with white opaque textured square glass details to the top. 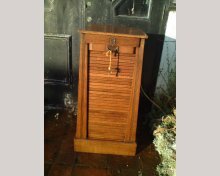 The central door and large lower drawer with brass heart escutcheons and brass stylized foliate hinges and handles. 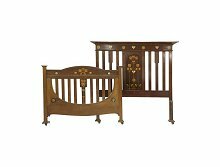 The simple case construction and stained green cypress wood and grouping of square details are typical of Mackintosh's early work for Guthrie and Wells including items bought by William Davidson for his house Gladsmuir, Kilmacolm. The brass cabinet fittings are identical on a number of pieces, see Billcliffe, p. 33, fig. 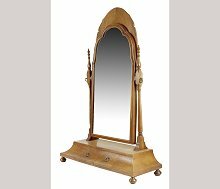 1895.2 and 1895.3 for a washstand and dressing table designed by Mackintosh, also made by Guthrie and Wells. Also a white painted wardrobe/compactum. The over hanging cornice has been adapted with hinged flaps to move it up a narrow staircase. 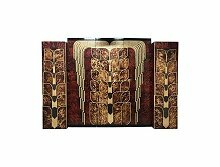 For a comparable piece see my other listing here for, C R Mackintosh. Writing Cabinet. Height 75", Width 58", Depth 20.75"
An exceptional mahogany 4' 7" double bed by Shapland and Petter with mahogany side rails. Stunning stylised floral inlays, using various fruitwoods, mother-of-pearl and Abalone depicting Glasgow style roses to the centre splats and circular and heart details to the headboard and footboard and colourful circular enamel details to the bottom corners of the foot board. Height of headboard 59". Width of bed (or mattress 4' 7"), Width of cornice 5' 2" Length 81" Note: This bed will take a 4' 10" or even a 5' mattress which would just over hang the side rails and still work well as the cornice is 5' 2" wide.Circa 1900. Bruce Talbert, attributed. 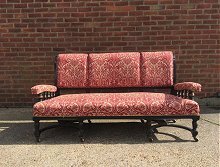 An Aesthetic/Gothic Revival ebonised and parcel gilt settee with stylish architectual serpentine stretchers on turned legs with original brass casters. Professionally re-upholstered in a contempary Morris and Co fabric. Height 35" , Width 67" , Depth 29.5". 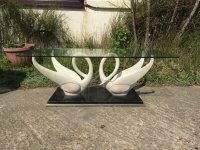 A rare coffee table by Maison Jansen with white composite swans with glass top, on a black gilt base. Signature to swans. GF Brangwyn. This desk was on display at the Scarborough Museums Trust's exhibition 'Brangwyn 1867-1956: Man of the People', in 2016. Co-curated by Dr Libby Horner, she focuses on prominent themes within the collection of 'the lives of man, at work, at rest and in times of distress'. H 32". x W 48". x D 28". H 91", W29.5", D 6". H 96", W 30 1/2", D 1". Overall measurements are : Height 96", Width 150 1/2", Depth 1" in the centre three panels and 6" at each end. 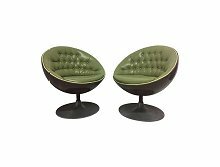 A fabulous pair of period swivel egg or ball chairs in the style of Eero Aarnio, Overman with aluminium tulip bases and Joveco style fiberglass ball seats retaining the original button back covering. EST 7221 aluminium base. Maker unknown. H 31", W 29.5", D 29.5". 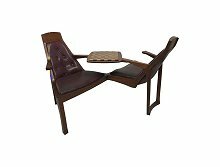 A superbly designed 'Danish style' teak duet seat for lovers of chess, this is a work of style, design, comfort and craftsmanship, it looks like it almost floats. There is a subtle organic feel about the whole composition. Beautifully hand made the quality runs through with cavernous chairs that are as comfortable as they look. Signed R Bellinger 1977. H 41.5", W 64", D 60". Antonio Citterio. 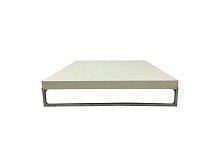 A sleek and simple Minimalist designed coffee table made by B&B Italia. Signed with decal manufacturer's label to underside B & B Italia Made in Italy Matalto Modello Tav. Solo Disegno Antonio Citterio. With Collaudo and insigniture. H 7", W 36", D 36". Liberty and Co. A circular mahogany side table with six legs, united by a central shaped shelf, the sides with floral inlays with mop and fruit woods. Dimensions: H 28.5', W 25.75', D 25.75'. Height 78" , Width 39.5" , Depth 16.34". 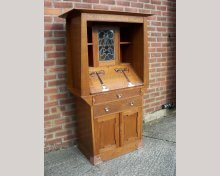 An English Art Nouveau cabinet with Queen Anne shaped top, the doors with parquetry panels depicting Art Nouveau women and men playing musical instruments to the upper and lower doors. The upper cupboard opening to reveal a fretwork Japanese scene to the back and parquetry floral details. The lower doors opening to reveal stylised floral details in vibrant colours with a lower drawer. Height 43" , Width 20.5" , Depth 16.25". 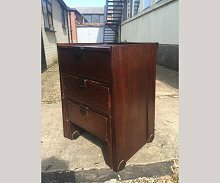 An unusual mid-century modern metamorphic desk with exposed tennons. The sets of drawers on wooden wheels allow this space saving piece of furniture to neatly compact. Height " , Width " , Depth ". 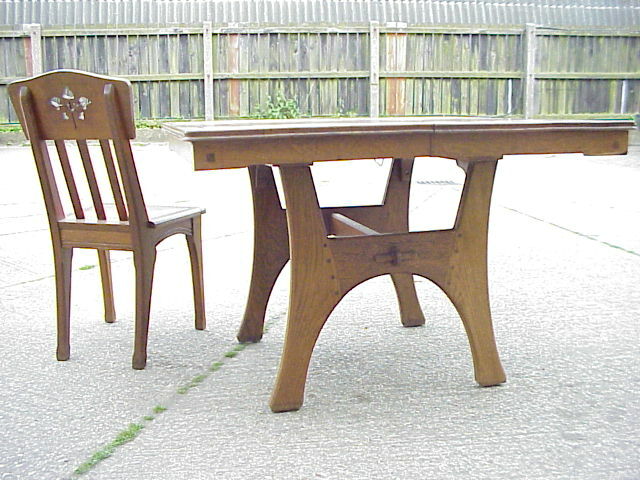 An French Arts and Crafts oak extending dining table and six matching chairs designed by Leon Jallot. The last two images are from 'Arts and Crafts' by Judith Millar. Page 63. 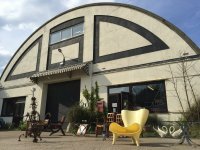 Where a set of six chairs are valued at £7000 to £10,000 and a Buffet is valued also at £7000 to £10,000. 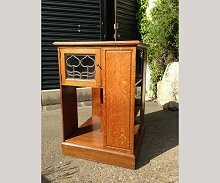 An Arts and Crafts revolving oak bookcase with stylised floral stain glass to small single upper cupboard. Height 30", Depth 20 1/2", Width 20 1/2". Circa 1900. Liberty and Co. A good quality Arts and Crafts revolving bookcase. Height 27 1/2", Width 19" Depth 19". Circa 1900. Designed by George Montague Ellwood (1875-1955) and made by J S Henry (John Sollie Henry, founded c1880) of Old Street, London. A pair of exceptional Arts and Crafts oak side chairs designed by George Montague Ellwood and made by J S Henry, inlaid with circular copper line details, centred by a pewter heart enclosed within a copper. The single central back splat united by two lower cross stretchers which cleverly emulate the lower twin side stretchers and single side uprights which are united by a higher single cross stretcher. H 42 1/2". x W 17". 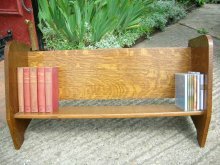 x D 16"
An Arts and Crafts table top bookcase which would also be perfect for CD's etc made from 1/4 sawn oak with through pegged joints. Height 14 1/2", Width 27" add 1 1/4" for both sides of the through pegged joints, Depth 12 3/4". Circa 1900. A rare Arts and Crafts oak record cabinet for holding 78's (LP's do not fit into this cabinet). 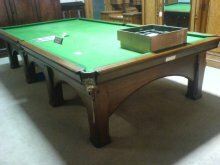 A rare Arts and Crafts oak snooker table by Riley in the style of M H Baillie Scott. ‘The Viceroy’ full size snooker table by Riley. An impressive table with strong square legs with precise architectural chamfered details that give each leg its subtle shape. With cascading sweeping side and end skirts that slot and join perfectly into the legs giving it a sturdy stance with soft edges to the eye. 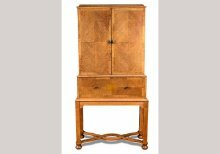 A stunning Arts and Crafts oak bureau bookcase designed by G M Elwood and made by J S Henry with metalwork by Richard Rathbone and an inlaid Motto that reads :- 'The Pen Is Mighter Than The Sword'.